Wast and Gulf Coast ports could become a viable alternative for U.S. Dairy exports. West Coast ports are up and running again after the International Longshore and Warehouse Union and the Pacific Maritime Association, which represents employers, agreed on Friday to end a nine-month conflict with a five-year labor contract. What does that mean for U.S. Dairy exporters looking to minimize risk in the management of their logistics and supply chain? "Part of this is our strength in the Asian markets, and part is the more recent emergence of California and other western states as dairy producers and exporters,” says Christieson, who manages USDEC’s global market research as its senior vice president, market research & analysis. Less labor volatility. The USDEC research report points out that while East Coast ports are more expensive, the labor contracts are generally less contentious than on the West Coast. The last serious strike on the East Coast was an ILA walk out in 1977 against container carriers. A strike was averted in December 2012 (over the issue of Container Royalty Payments), which could have impacted 14 East Coast ports. Thus, this higher labor cost structure remains. This year’s West Coast labor disputes were nothing new. For instance, in 2002 an 11-day lockout involved the closure 29 West Coast ports, costing the economy an estimated $1 billion per day. Increasing viability of the Panama Canal. The East Coast ports generally have low capacities compared to those on the West Coast but hard work has been underway to dredge. A turning point was provided by the strikes which hit the Los Angeles port in 2004-2005. This led trade away from L.A. and across the country on intermodal, towards the all-water route down the West Coast and through the Panama Canal up to the East Coast. Improving rail access to East Coast ports. Rail access to the East Coast has always been problematic, but the rail companies servicing this region see the changes to the Panama Canal as an opportunity to expand their market into the Midwest and have been investing in systems to enable this. A good example has been the major spending on the Heartland Corridor between Norfolk, Va., and Chicago, which has involved extensive re-drilling and facilitation for double stack freight. As this post, "West Coast Labor Dispute a Bad Deal for U.S. 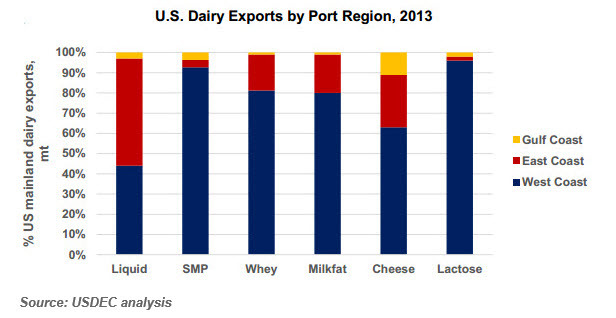 Dairy Exporters," indicated last week, West Coast ports have an obvious geographic edge in shipping to Asia. That will be difficult for other ports to overcome.